The bad news though, is that long-running stalwart, ROGER The DODGER has been murdered - and replaced with a strange, alien-looking creature that seems immensely juvenile in both art and lettering. Having ditched the nursery look in the rest of the comic, whatever possessed DCT to let the artist letter his own work? The lettering, which is not much more than a scrawl, and the balloons, which are far too large, dominate the panels, and are not only sore on the eyes but utterly uninviting. I didn't even bother trying to read the strip, which is populated by basic, unappealing, bug-eyed jellyfish-type doodles, 'illustrated' in the 'How to Draw Comics Quickly and Without Much Effort' style that the artist is (in)famous for. The editor, the same man responsible for the decisions behind the demise of The DANDY, doesn't seem to have learned much (apart from in the lettering dept - bar one), from his previous mistakes and seems determined in trying to convince us that, when it comes to what comic art should look like, he knows best. We can only hope that what is so far only a small irritating rash does not turn into the same full-blown terminal disease that doomed The Dandy. I'm with you Kid - if I opened the pages of a comic and saw that mess in front of me there's no way I'd be tempted to engage with it any further, turning the page quickly in search of real talent. Immersed as I am, and no doubt so are you, with a lot of comics from an earlier era, when drawing ability, composition and decent lettering actually invited you to read the story they were telling, it's a shock to the system to check out what passes for comics now and encounter this! I am not saying that there is no talent in the field now but it's probably not getting much of a look in while editors think that the likes of this is 'what the kids want' and publish it ahead of anything else. 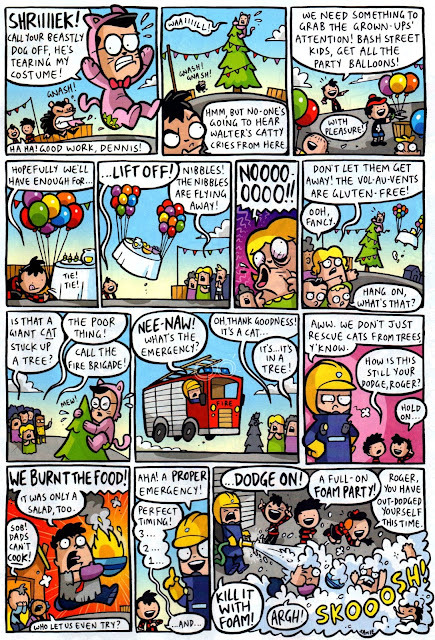 The saving grace, Phil, is that the rest of the comic (in the main) is drawn to a much higher standard. Thank goodness, eh? However, I fear for the future if the editor continues in his seeming determination to turn it into a Dandy clone. Whole comic looked a mess to me. Bring back Billy the cat. I'd certainly agree about bringing back Billy The Cat. Long overdue. I didn't mind this one, it's a step up from the stuff I've seen on the, now defunct Dandy web site, it actually made me giggle in a few places. It's not am exemplar of comic strip art but I do see potential, I think the illustrator faced a bit of a challenge with the script, it needs some judicial application of blue pencil. There's some nice touches in the script though, like the "nibbles" gag but it's a bit lost in the jumble and although I did get the "Kill it with Foam" reference, I'm left wondering if any of the gags went over my head. I'd like to see the illustrator expand those panels and use less of the stick figure stuff. The "Greatest dodge" panel where there was an effort to put some drama in was a bit half hearted but I'm guessing the illustrator was struggling for space. I do think the illustrator has quite a good line though. As for the lettering, I suppose they're going for the informal feel, which is ok but tricky to pull off, I've said it before, it's an underrated art. One thing I will say, DSE, is that the artist is using a much smoother and less blocky line than he used on The Dandy, so that's an improvement. However, the storytelling aspect of the art just fails to impress. Also, as I said, the lettering is far too prominent - it would be interesting to see the strip with the same font as the others in the comic. Kid, if you're not a fan of the lettering - may I ask what your opinion is of Alexander Matthews' Ball Boy and Nigel Parkinson's Dr. Martens advert as both do use hand-written lettering. They look like they're just as big as Jamie's speech bubbles. Also, I don't know if you recall Thingummyblob from The Dandy in 2011 by Jamie Smart but it used a font instead of hand-written lettering and actually looked really ugly. There's something about the way Jamie writes his gags that only works with his lettering, it looks weird with anything else (see 'Hairy Steve' where he wrote the story and Steve Bright drew it, it doesn't well at all well). I prefer the Beano speech bubbles as well as they do look nicer - but it doesn't bother me because I don't think Jamie's stories would work as well if they were lettered by The Beano. Kid, I think this "blob art"style has its place in comics, but maybe not over 2 whole pages. A third of a page, 3 or 4 panel strip would suit this minimalist style. I could take such work in a small dose, because some of the things he draws are quite cute. I suppose the illustrator wants to achieve a harmony of his lettering style and drawing style. 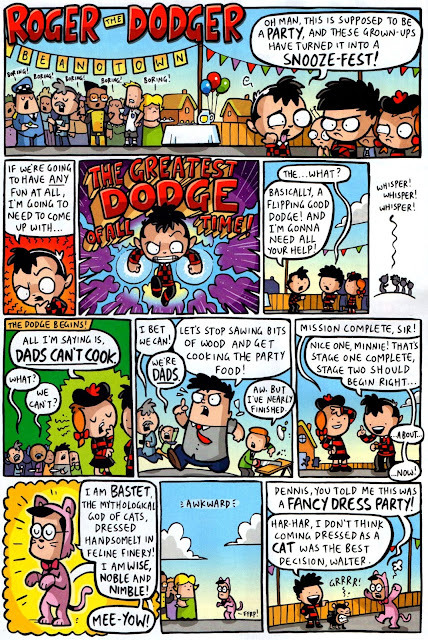 It certainly is interesting that DCT would allow an illustrator to portray their iconic characters such as Dennis the Menace so off-model. For instance, I did not recognise Walter, as he has the same face and proportions as the other characters, the illustrator did not graphically interpret Walter's wimpiness. In fact, he did not interpret any of the character's unique personalities.The only way you could tell them apart, was by their uniforms (Dennis's stripey top, Roger's checked top, etc). The expressions are interchangeable, they all laugh the same, they all shout the same, they all pose the same...Everyone is painted with the same brush. The background characters are even more bland, static, often appearing legless, cone-like figures, portrayed so that they do not over-power the main characters. It all looks very rushed, with no real visual pacing, graphic shortcuts are in abundance. Jamie Smart is probably no fool, because in effect, he dilutes the Beano (or Dandy) brand by promoting the Jamie Smart brand! Having just looked at the comic again, I'd say that Ball Boy's lettering is also a bit on the large side, but it's neater than on Roger and doesn't dominate the page as much. As for the advert, although the lettering is quite large, there's only three tiers, so it isn't as out of proportion as on Roger's strip, and being an ad, it needs its own distinct look. If you look at it, the lettering doesn't fill most of the panels as it does on the Dodger pages. I hear what you're saying, but unfortunately I don't think the pages by the artist in question work at all, never mind well. To me, the art and lettering are just ugly. I suppose, in that way, they suit each other, but that ain't a good thing in my estimation. Don't recall Thingummyblob at all, oddly. Unfortunately, Jake, his brand isn't a particularly effective one when it comes to sequential art. I've said before that some of the stuff on his blog has its own charm and that he's produced single illustrations that work quite well, but the problem is that it's a style which just isn't suited to comic STRIPS. It's all too much of a mish-mash in my opinion. I think the strip might've worked better in colour and with better lettering, and it could do with a polish. At least it's clear what's happening 'though. So out of a 44 page comic you choose to focus only on the two pages you disliked most. Why not try being a glass half full person for a change? So, out of a 993 posts blog, you choose to focus only on the one you disliked most. Why not try being a glass half full person for a change? And you're conveniently ignoring the fact that I gave the switch back to upper case lettering a positive thumbs-up. Follow. Your. Not. Advice. Own. Why. 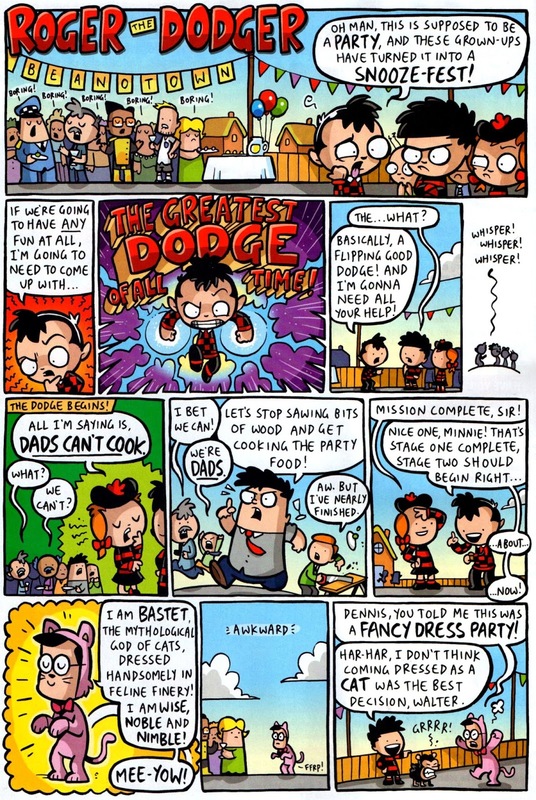 A lot of things shocked me with this celebratory Beano, besides the obvious Roger the Dodger weirdness. The amount of celebrity caricatures in there was just obscene (the amount of work Mr. Parkinson gets in the Beano is obscene, full stop!). And Ball Boy's looking like puberty's finally hit him with everything it's got. BUT, the MOST unsettling thing in there was the apparent permanent demolition of Bash Street School! Along with Teacher's mortar board too. Looks like they're all moving to Beano High now. I don't really mind Nigel Parkinson getting loads of work if the alternative is lesser artists like that on Roger. In fact, I would've preferred if NP had drawn that as well, but the editor seems to be making room for his 'faves'. NP can vary his style a bit, but I can see why a bit more variety might be a good thing, although other artists should be of the same calibre as Nigel. As for the celebrities, they were just to generate interest in the media, I doubt the readers will be much impresed by them. However, if the stories are funny enough and can stand on their own two feet, no harm done I suppose. They're at it again! Step in time! They prolly use more amateurish artists because they get them cheap? I'll tell you what I find annoying about Jamie Smart! - the way he keeps banging on about school dinners and saying, "pucker!" and all that! J.P. I picked up a copy yesterday, after experiencing it in the flesh I see where the comments about the lettering in this one are coming. I do like the script, it seemed to me to be the strongest one in comic. 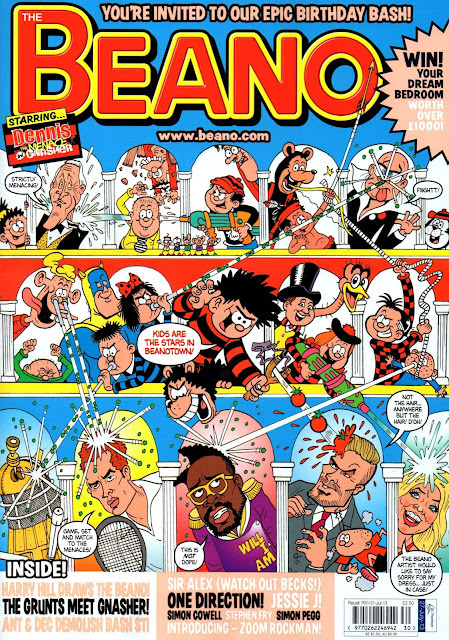 ric_mac has managed to nail some of the aspects of the changes in British culture that has brought about the diminished appreciation for the kind artistry the Beano used to present and I would definitely concur with those points. I hope there is a future for the Beano but I think it'll be difficult, print distribution is, I think, reaching a crisis the nature of which can be inferred from your post subsequent to this. In my part of the country Smiths now holds a near monopoly on high Street periodical distribution, a dangerous position in itself but there are ominous signs that it's being set up for an asset raid. If that should come about it would be catastrophic for the periodical market. Having now read the strip, it IS fairly amusing, but I think it would've been improved no end by drawings that weren't fighting for space with the speech balloons and a more traditional artistic approach - plus better lettering. There's just something about it as is which is completely uninviting from a visual point of view. It simply doesn't make me want to read it. RIP Roger The Dodger? I think RIP Beano would be more fitting now that the utterly talentless and egotistical Jamie Smart is on board. The Devil must be itching to collect that soul! One can only assume that DCT have a death wish regarding their comic titles. To basically transfer the entire staff responsible for the Dandy's demise over to their flagship title is beyond comprehension. I can picture next years headlines already : 'After 76 years Britain's longest running comic sadly closes it's doors'…. I think you'll find that most artists have a bit of ego, Anon, so he's hardly alone in that. And the Devil (should he exist) probably itches to collect as many souls as he can, regardless of to whom they belong. You're right in your final assessment 'though - to reward failure by giving those responsible for it a chance to ruin something else certainly boggles the mind. Notice how it's more of a gradual shift with the Beano, like they think people won't notice? Praise be to Dave Sutherland for hanging in there, he's all that's holding the thing together! 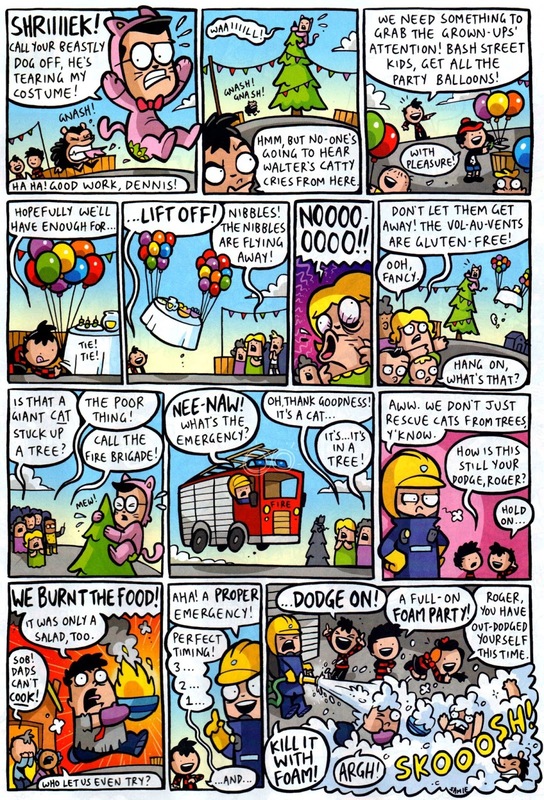 (That said, I like Wilbur Dawbarn's stuff a lot). I'm not a big fan of his own style, but when he 'ghosts' the original artist - like he does on Billy Whizz - then I'm quite happy. Seeing this travesty of a strip has me running back to my collection of Dandy/Beanos from the 50s/60s. Now if only I can find a Roger inspired dodge to avoid having to mow the lawn! Put off beginning it until it starts to rain - that should provide the only excuse you'll need. I don't understand the Beano people. If the old style was good enough for three or four generations why change it now? How can kiddies understand what's going on in those pictures? I can't ? I think some editors just like to stamp their own identity on things for the sake of it. Some of the things they do are beyond me. Who knows, THB, but that may be the very way artists like the one in question got their start in comics. An editor thinking "Well, I can't make heads nor tails of this, but we'll publish it anyway and see what happens." Trouble is, now that they've seen what happened in the case of The Dandy, they should have learned their lesson. Kid, there there must have been many mediocre artists and writers during the heyday of British comics. Because there were so many titles and so much variety, that gets lost. Now there is only the one comic remaining and its under the microscope. The Beano exists because it still makes a (small) profit. Like any business politics plays a part. People like to work with people that they like. The editor has built up a rapport and relationship with some of these artists and probably believes this will contribute to success in the long run for DCT, the Beano and of course themselves. They want a win-win situation. How is it in anybody's interests for the Beano to fail? But of course if this new Dennis magazine sells well, that might change things. Dennis is the only multimedia star they have, he is the DCT "Judge Dredd". So maybe they will follow the Rebellion model and publish 2 regular titles, with fewer strips in the Beano, each 4 or 5 pages long. The mainstays being DTM&G and TBSK and rotating other characters. That's just one opinion. What you say is undoubtedly true, Jake, but it overlooks one important point. The experiment that was the relaunched Dandy failed. That being the case, it's the triumph of hope over experience to transplant the very elements that were responsible for The Dandy's demise into The Beano. I'm already seriously considering whether to stop buying the comic because I don't like the direction in which it's headed, and I surely can't be the only one. Perhaps Dandy failed because the relaunch wasn't advertised properly? People can't buy it I they don't know it exists. The Dandy relaunch was very well advertised (although not by '60s standards obviously), and apparently circulation increased at first before then dropping by half within a few months. This tends to suggest that readers just didn't like it. Where was it advertised? No TV ads. Not even ads in Sunday Post or Thompsons other publications until it was too late. Naturally circulation increased initially because there were more copies printed and in circulation for the relaunch. Sounds like you're confusing circulation with sales. Two different things. If there are less issues in circulation it can't sell as well. Circulation fell so sales fell. As I said, it wasn't advertised in the same way as it would've been in the '60s, hence no specific TV ads. However, it was covered by the media, including Sky News, various newspapers and comics news blogs. It was this promotion that led to its initial increase in circulation before it took a dive. DCT wouldn't have gone to the expense of printing more copies unless they'd first paved the way by promoting the relaunch. It was the promotion which created the 'demand' for the relaunched comic - the higher numbers printed merely serviced that increased demand, at least for a while. The readers soon deserted the comic - despite the higher numbers available. Sounds like you're contradicting yourself. You say that circulation and sales are two different things and then give an example of how they are, in fact, synonymous. I don't think you quite understand in what context the word 'circulation' is used in regard to comics. Circulation figures are not the amount of comics published and on sale - they're the numbers that are actually sold. Not every issue of every comic printed actually sells. Those unsold comics are returned to the distributor and then to the publisher. If the comic receives a bit of promotion, more copies than normal may well sell - without any more copies being printed than is usual. So circulation can increase without more copies being printed, and it can decrease without fewer comics being printed. In The Dandy's case, increased numbers (printed to meet expected demand in response to promotion of the relaunch) were still being printed when circulation/sales - after an initial surge - started to fall. In that instance, increased numbers did not result in a continuing increase in sales or circulation. Unfortunately Thomsons DIDN'T pave the way properly prior to the relaunch. News items appeared on breakfast tv etc it is true, but viewers either forget that or they don't pay full attention. No advertising in the media or in their own publications. Massive fail which led to target audience not knowing about it. Then when they DID finally advertise, months later, distribution was so poor the readers couldn't find enough copies in the shops to buy even if they wanted it. Unfortunately I haven't seen any ads for the new Beano yet either so how it will gain readers is anyone's guess, let us hope it works. I never claimed that Thomson's paved the way 'properly', but there WAS media coverage at the time, doubtless engineered by DCT themselves. And, 'though it could've been better, the promotion initially worked - that's why there was an increase in sales to begin with. And the reasons why readers couldn't find copies in the shops months later was because the shops decreased or cancelled their orders as, by then, the comic just wasn't selling. Interesting your recent comment above about the Beano becoming a Dandy clone. Here are your words from 09/11/12: "You'd think that D.C. THOMSON would seek to entice The Dandy's 7,000 readers by combining it with The Beano when the former expires in a few weeks..."
I suppose the editor would like it very much if those former Dandy readers would return to the fold and start buying the Beano, resulting in a healthy 15% increase in circulation. I believe the Digital Dandy is shutting down, so those artists/writers need work. So, by stealth, that was once the Dandy experiment will creep into the Beano, creating a hybrid. It would've been a good idea to make The Dandy more like The Beano, but the idea doesn't have the same potential in reverse, I'm afraid. Therefore, I'm hoping that 'hybrid' just doesn't happen. Some collectors still talk about mergers as though it's something publishers still do. It was a sales gimmick that faded away last century! I can't remember the last time two comics "joined forces" but it must have been over 13 years ago. It was a sales gimmick brought about to combine the circulation of two comics - and it worked, which is why it was repeated so often over the decades. Just because it hasn't been done in a few years hardly seems good enough reason not to do it now if it would add the readership of one comic to another. Bad news indeed. I've decided I won't be buying another issue from now on. Not going to waste £2 which can be better spent. Your saving £2.50, it's gone up! I think lots of people will be voting with their feet and quitting it. It's a shadow of what it was 12 years ago. It's just not the Beano now. It's sad. Result! So no more bad reviews from you then. Muggy, I knew the anniversary issue was £2.50 because it had 44 pages, but I thought it would be the usual £2 from the following issue. Another reason not to buy it. Anon, don't be silly - I said I won't be buying it from now on, but I'll still be looking at it from time to time. So there'll still be the occasional accurate, honest and considered reviews when I think they may be of interest. A review based on flicking through it in the shop is as valid as a film review judged on the trailer. I don't recall saying I'd only be 'flicking through' it. You're creating your own scenarios against which to argue. A hobby might help - apart from making an @rse of yourself around here, that is. I doubt the celebrities were paid, Jake - they regard it as an honour to appear in The Beano. Regarding the price rise, it's one sure way of scaring the customers away. However, the extra 50p will compensate for the vanished revenue from lost readers - for a while at least. It's just madness how they've decided to turn it into the Dandy, it really is. Looking through this week's issue I saw stories about Olly Murs, Simon Cowell, Mr T and (I think) the judges from Master Chef. And something to do with Moshi Monsters (or similar). It makes no sense whatsoever, and has left me feeling confused and angry. It's been fun for the last 20-something years of my life, but it's all over now. THB, obviously the editor has a 'vision' of what a comic should be and, having been thwarted with The Dandy's cancellation, is now trying to follow through with The Beano. If it manages to cling on for a few years, he'll then claim that as vindication, saying that it proves it couldn't have been the content that killed The Dandy. Of course, that's to conveniently ignore the fact that The Beano is currently on stronger footing than The Dandy was and might weather the storm for longer. Although that Roger story IS funnier than it's been for many years it has to be said. Mildly amusing at best, I'd say. And Bob Nixon would have done it in one page without it seeming half as crowded. But would it have been as funny? Same story? Funnier - and better drawn. The Beano bookis out now Kid, that's more traditional. I'll be buying it at some stage, Muggy, but I fear it'll be my last one. Any idea why the beano isn't out this week, shops say they cant get it? DCT don't seem to know about it. Someone's looking into it now 'though. I may have some info shortly. I heard it was problems with the free gift. The packaging department had stuck last weeks gift on some copies so they had to be done again. Having spoken to DCT, I'm told that there is no problem of which they're aware as to why shops would not have this week's Beano. Same goes with their subscriptions - no reason why copies should be delayed. Beano died for me when they made Dennis the Menace lose his menacing chin and made him look cute from the early 90s onwards.. became like any other cheap comic.. The strip certainly lost its magic when Dennis became 'cutesy'. He just didn't look like a menace anymore. "HEAVEN IS A VERY SMALL PLACE..."
WHATEVER HAPPENED TO MIKE MITTELSTADT?